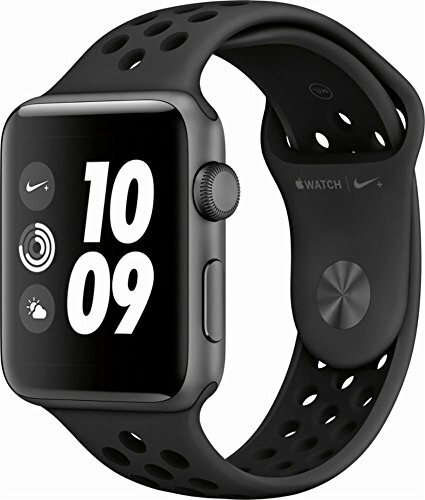 Apple Watch Series 3 Nike+ - 42mm - GPS - Space Gray Aluminum Case - Anthracite/Black Nike Sport Band by Apple at Kode Fu Guru. Hurry! Limited time offer. Offer valid only while supplies last. Stay connected in style with the 42mm GPS-only Apple Watch Series 3, which comes with a Space Gray anodized aluminum chassis and a gray Sport band. Stay connected in style with the 42mm GPS-only Apple Watch Series 3, which comes with a Space Gray anodized aluminum chassis and a gray Sport band. Designed for users looking for the next generation of connectivity, Apple's Watch moves your iPhone's apps and functions to your wrist, so you can do more while leaving your phone in your pocket.